I mentioned two or three alignments of Route 66 through Oklahoma City; it's really three plus numerous slight changes over the years of a few blocks here and there. We covered just two. We'll start with the earliest route, right through the heart of the city. This route never was abandoned, just renamed to Business Route 66. The other alignments were called Alternate Route 66 and bypassed the city. There isn't much left of Route 66 oriented businesses on this alignment. 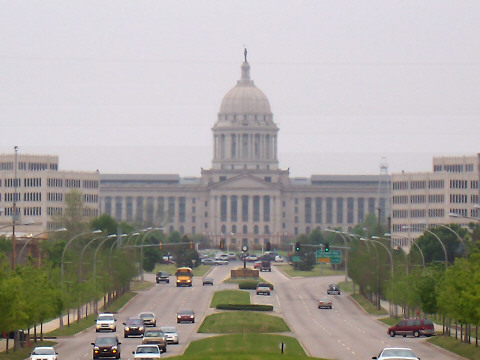 But this view of the state Capitol building is spectacular, even on the overcast day we visited. Surprisingly there wasn't much traffic, even though we were there on a Tuesday afternoon. If you stop at the Capitol you'll see the oil derrick, right on the lawn. 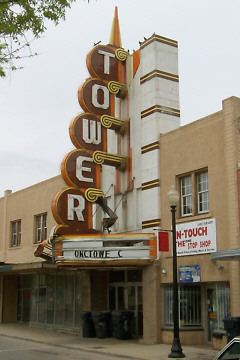 Just past the old gas station is the Tower Theater, another restoration candidate. Unlike the Coleman Theater in Miami, this one is in sad shape. But the sign is great and it's just begging for some group to take over and restore it. 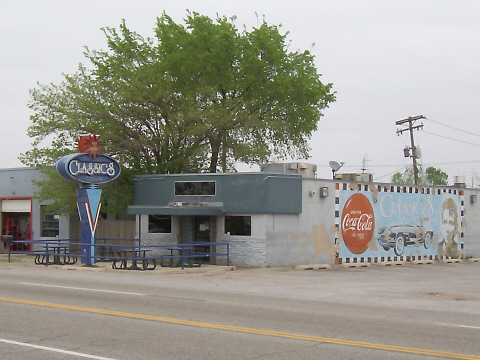 A few block further, just north of 23rd street on Classen, is this small building with a giant milk bottle on top. 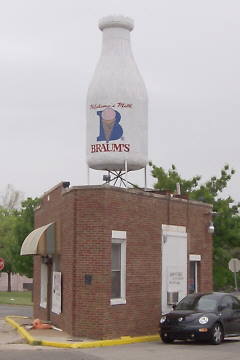 It used to advertise the The Townley Milk Company but now is owned by Braum Dairy. 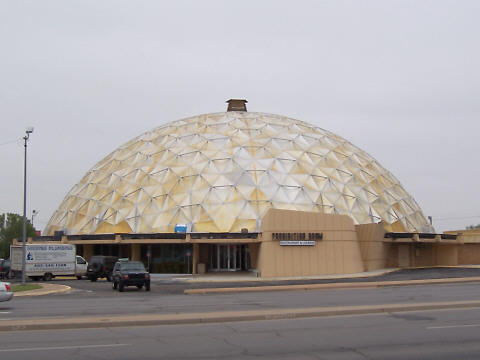 Near the giant milk bottle at corner of 23rd Street and Western Avenue is this Golden Geodesic Dome. I doubt that it was here in the Route 66 days, but it's still a sight to see and worth a picture. At this point the Business and Alternate Route 66 alignments join. So let's rewind back to Edmond but this time we'll take the bypass route. 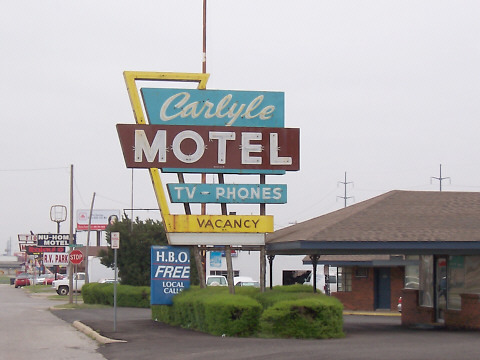 Lot's of old Route 66 motels, gas stations and more along here, some of which are still doing a thriving business. 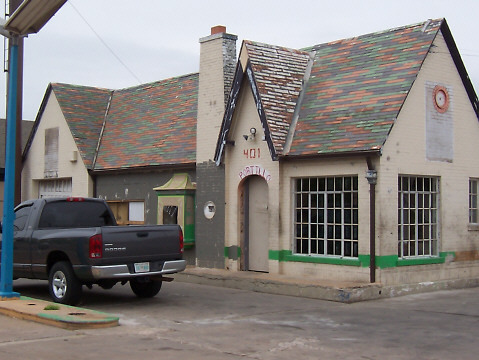 On Britton Road, just east of Western Avenue, John Dunning is restoring the classic Owl Courts Motel. It's been under restoration for many years; don't plan on booking a night here for the near future. 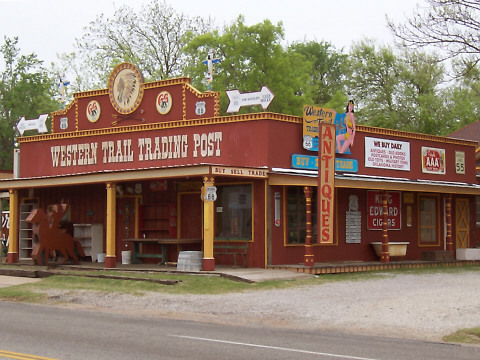 Around the corner on Western is Dunning's Western Trail Trading Post. 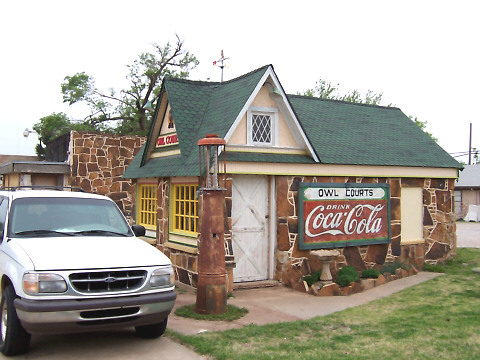 Browse the Route 66 memorabilia here, although the store hours are sporadic. Further south the road passes many vintage building including this restaurant, the Classic Club. It has a great James Dean mural on the south wall. 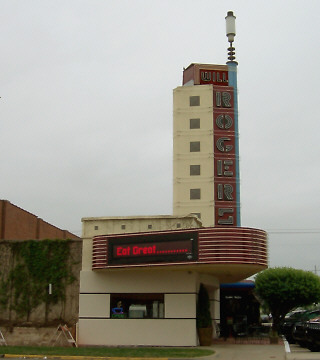 Another restaurant is housed in what used to be the Will Rogers Theater. It was very cloudy when we visited so the picture isn't very impressive. You might want to drive past it at night. That tower and marquee should be spectacular. Finally all the alignments join and follow the 39th Street Expressway (four lane but not limited access) out of town. 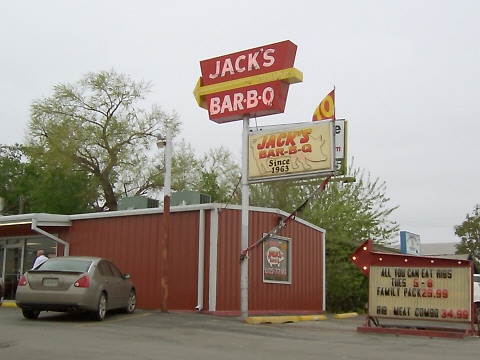 Many great neon signs here like this one for Jack's Bar-B-Q. 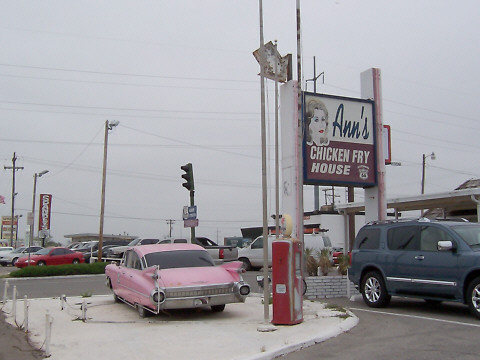 Also in the food category is Ann's Chicken Fry. There's a great Elvis mural on the side of the building. Very fitting with the pink Cadillac parked out in front. 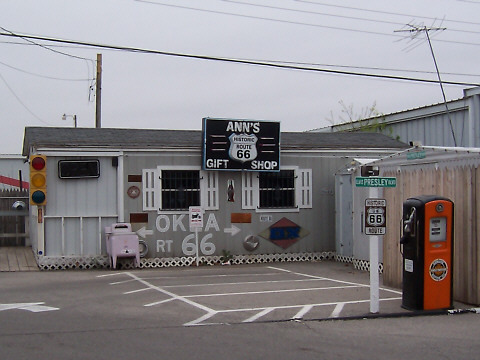 To cover all tourist bases, Ann also has a gift shop in back, on Elvis Presley Boulevard no less. It wasn't open when we were there. I'm not sure if it ever is. Two of the Route 66 era motels are on this stretch of road and very close to each other. This one has a great neon sign, although the motel (and it's clientele) don't seem to be what they were in the days of Route 66. You can see this sign in the picture above. It shows that not all of the signs along Route 66 were spectacular neon extravaganzas. And that R.V. 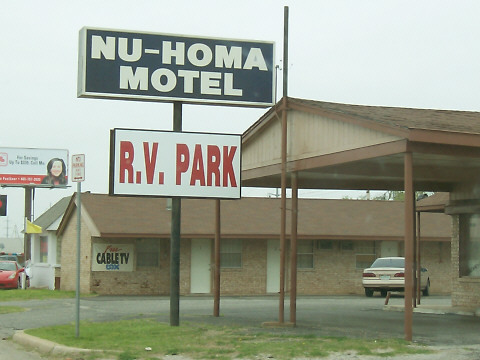 Park addition gives a clue as to what the Nu-Homa has become. Even though we took a full day to explore Route 66 in Oklahoma City, I'm sure there are things we missed. Some were overlooked, some just to deteriorated to photograph, and some we just didn't have time for. But it was time to move on west. That page is coming soon. Meanwhile move on with us to Texas by clicking the little arrow below.